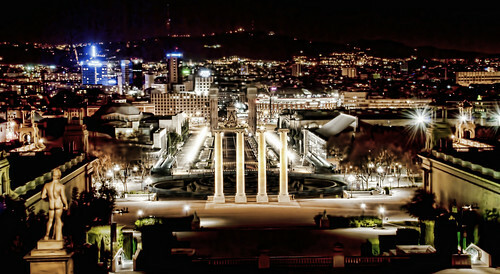 Barcelona is the first city in Spain coined a “Smart City” and is named the fifth overall in Europe in 2013 ahead of Paris, Stockholm, and London. And with all the noise about the Mobile World Congress this week (with Mark Zuckerberg as a keynote speaker), Barcelona will be the epicenter of technology and innovation come Monday. But, it’s not necessarily technology that makes a city “Smart”. According to Boyd Cohen, a famed urban and climate strategist, a Smart City ranks high based on these six “Smart” indicators: Smart Economy, Smart Environment, Smart Government, Smart Mobility, Smart Living, and Smart People. Its citizens live in a vibrant culture with an open government trying to improve green living spaces, and it makes wise investments in the future. Smarty pants of a city. 01. Its stellar bus transit system. 02. Its bicycle sharing system, Bicing. 03. Its installation of smart parking spaces. 04. Its pneumatic waste management system. 05. Its installation of smart lighting. 06. Its use of renewable and more effective energy systems. 07. It’s the Mobile World Capital. 08. Its urban mobility through apps. 09. Participatory citizens and transparent government. 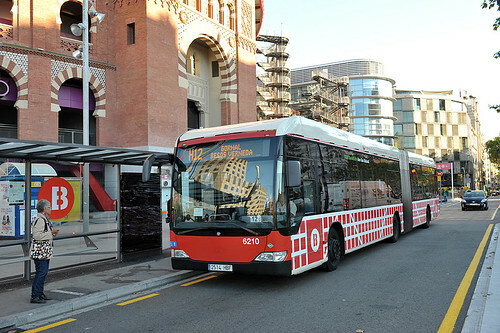 Barcelona’s transport system, Transports Metropolitan de Barcelona (TMB) recently debuted a new orthogonal bus network (horizontal, vertical and diagonal lines), making it faster, easier to use, and more frequent, among other features. 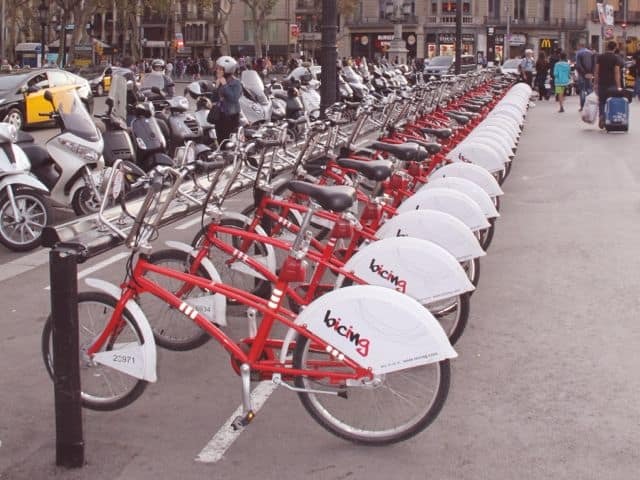 Its goal is for the traveler to make one transfer between any two points in Barcelona in 95% of its journeys. The bus system also has urban sustainable mobility, reducing emissions with hybrid buses. (In fact, when it stops, you can’t even hear the motor.) One of the cleanest surface public transport fleets in Europe, it also has smart bus shelters using solar panels and screens provides waiting times. Three interactive bus shelters are already installed, which has a touchscreen and USB ports. 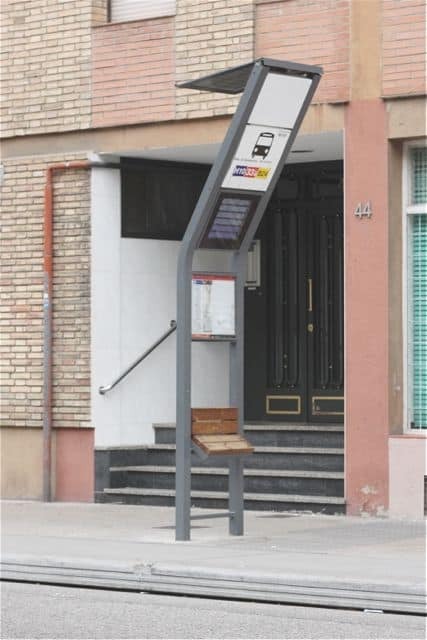 Smart bus stop: a solar panel to activate a screen that shows arrival times — and a seat for a waiting traveler. With 6,000 bicycles circulating, Bicing is a sustainable and economical form of transport, designed for citizens to travel short distances without consuming any energy. You pay an annual fee, get a Bicing card, scan it at any of the 400 stations, check out a bike, then check it back in at the station closest to your destination. Most stations are located by other public transport stops or public parking. Recently, the new Bicing app became available for users to check out real-time availability at stations, making it easier to plan a route if one station has unavailable bikes or parking spaces. Using light and metal detectors, sensors detect if a parking spot or loading area is occupied. 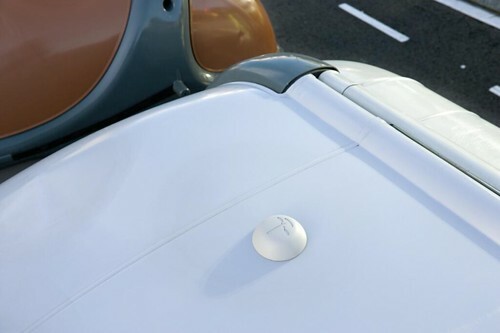 These street sensors help motorists find parking, but they also provide data about parking patterns, helping officials improve management of urban mobility. Many barris don’t have to see (and smell) overflowing and oversized trash bins. These compact drop-off containers have a subterranean vacuum network through the pipes, sucking up trash below the ground. This automated waste collection system decreases noise pollution made by trash trucks (at 11:15pm in our barri) and keeps the public space and stench clear. Drop-off bins on Gran Via de Les Corts Catalanes. 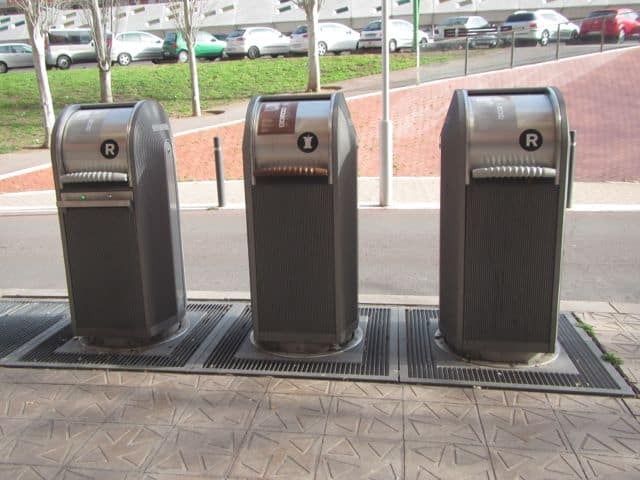 In the Poblenou and Sant Cugat neighborhoods, sensors on rubbish and recycling bins have also been tested. Through radio frequency and WiFi, the sensor gives data to a central system, detecting the trash level. Sanitation workers can then plan the optimal route and times to collect it. This little doodad tells a central command center when it’s full. 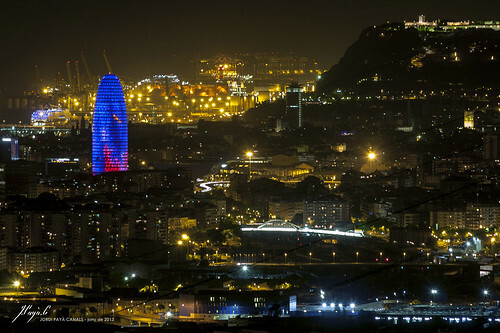 More efficient lighting using LED technology is being installed in Barcelona to reduce cost and pollution. These lights optimize energy and use a smart function: it activates when detecting motion, but also gathers environmental information, humidity, temperature, pollution, and noise. Already installed in several places such as the Born neighborhood, we can expect 3,360 lights on 160 streets to be finished by 2015. Coming soon: more intelligent lighting. Do you think about where your hot water comes from? 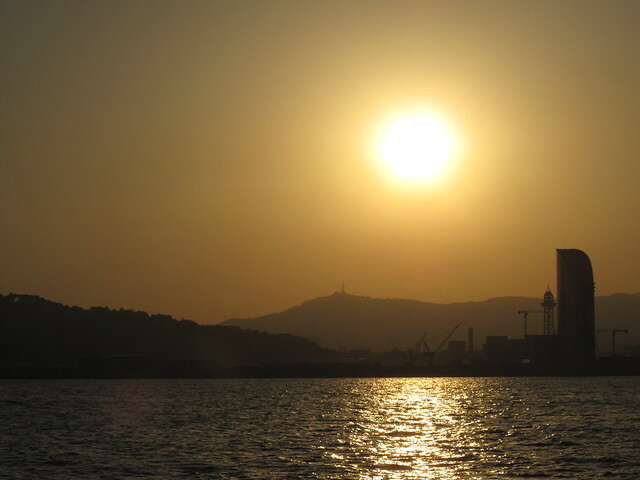 With seven hours of sunshine a day, Barcelona has taken advantage of the ample solar energy. 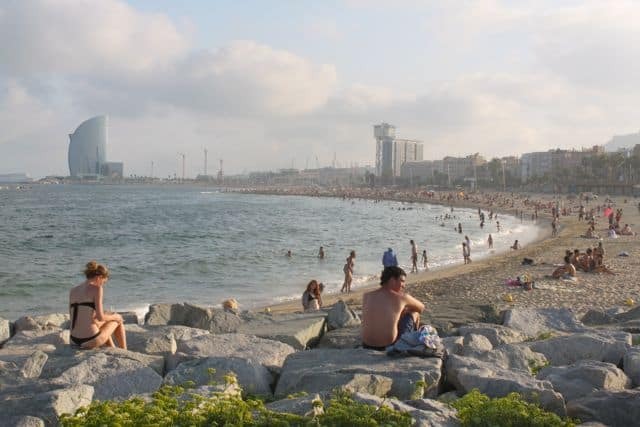 Barcelona Energy and the Barcelona City Council implemented a sustainable energy initiative, making Barcelona the first city to require to use solar water heaters in 2006. 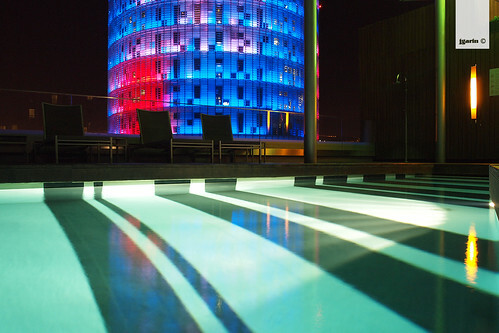 In 2000, the Barcelona Solar Thermal Ordinance also regulated all new large buildings such as hotels, hospitals, gyms, or swimming pools to produce their own domestic hot water, lowering emissions. This ordinance is the first of its type to be executed in a European city, and other cities have followed suit. Heating a pool the green way at Hotel Silken Diagonal. What about heating and air conditioning? 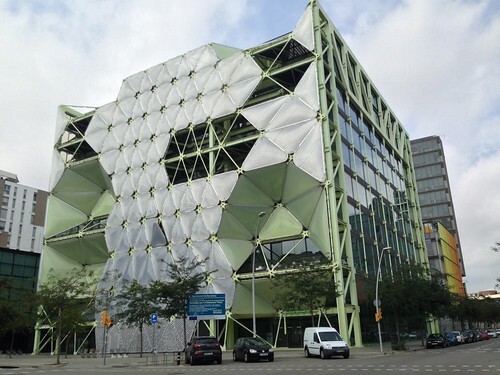 Already in use in 78 buildings and is expected to expand, the Districlima heating and cooling system produces green energy “equivalent to planting 548,000 trees, or nearly 4 times the number of trees in Barcelona.” The heating uses steam from the incineration of urban waste and the cooling uses seawater for refrigerating, producing less fossil energy consumption and carbon emissions. Districlima plant uses local Mediterranean seawater to cool buildings. You may have seen this interesting sea-facing structure by the Forum in Barcelona. As one of the largest photovoltaic installations in Europe, this solar panel produces 550,000 Kw/h a year, which can generate power to over 160,000 households. This provides homes and businesses sustainable energy, reducing emissions equivalent to 440 tons of carbon dioxide. More solar panels are being installed in the city. Making energy. A curious sight by the Barcelona Forum. Check out this interesting video of ways that renewable energy is being used and spread across Barcelona. 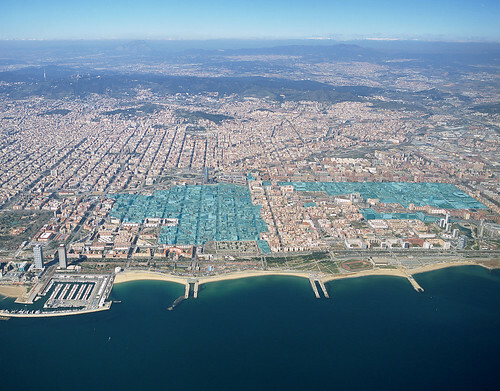 In 2011, Barcelona beat out 29 other cities as the Mobile World Capital from 2012 until 2018. Barcelona was an attractive candidate because of its conference and exhibition facilities, tourism and transportation infrastructure, and its commitment to extending the reach of mobility locally and nationally. Last year, over 72,000 people attended the Mobile World Congress, the massive international telecommunications event. Supposedly, the grand four-day affair has created more than 7,000 temporary jobs and added a whopping 350 million euros of extra spending to the local economy. And that’s good news for the people. Trànsit app: checking out what traffic looks like. TMB Virtual. Getting around through public transport is made easy. Point your smartphone’s camera in any direction, and “bus stop signs, lines and the distance to them in metres will appear on the screen, superimposed on real-world images. If you turn your phone sideways, it becomes a compass and each stop is shown as an arrow pointing in the direction to take”. 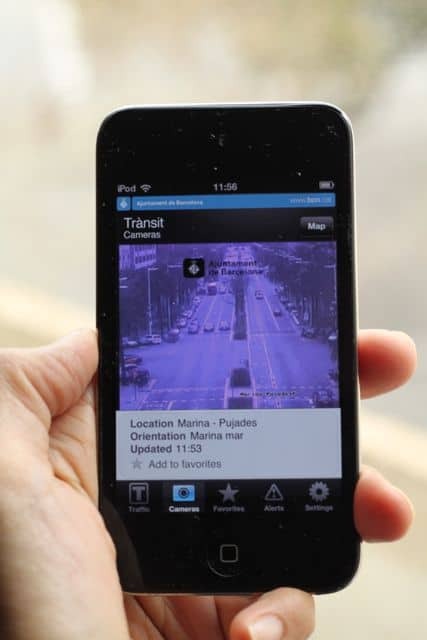 Trànsit – If you’re a driver and you want to navigate the city effectively, Trànsit helps you find the best route. You can also look at real-time traffic updates through the municipal traffic cameras. Mapa Tricentenari – Not really an app to help navigate the city, this is a fun app for history geeks. Commemorating the Tricentenari, 300 years after the War of the Spanish Succession on September 11, 1714, this augmented reality app uses a map of Barcelona on Passeig Lluís Companys. Point your camera at any of the numbered places, and information of Barcelona in 1714 appears. I can’t wait to do this. 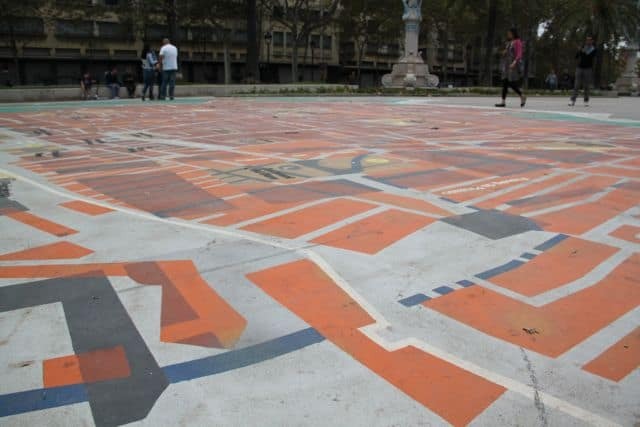 Point your smartphone’s camera on this Barcelona map on Passeig Lluís Companys. And there are so many more helpful apps by the Barcelona City Council for locals and tourists. Bústia Ciutadana – Citizens can make complaints, file reports of city problems such as a broken street light, or make suggestions. Data is sent to a central location, and officials respond to the the user promptly. Watch this video. You don’t have to come all the way down here and wait. IDBCN – This app enables citizens to digitally identify themselves remotely. They can get a Barcelona residence certificate, check their register details, or even locate their towed vehicle. Open Data BCN – This is public information that is available for everybody to reuse it however they like. Citizens, businesses, and other institutions can use the info such as election results, population, public facilities, or economy to generate new services instead of starting from scratch. For example, according to a Microsoft Case Study of Barcelona, they can mine open data regarding Barcelona’s citywide festival, La Mercè — find out how people moved, their interests, or entertainment venues. Then they can use this data to improve the logistics for future festas. More on Barcelona eGovernment here. Last but not least, 22@, the districte de la innovació (innovation district) was approved in 2001, and it’s a daring and experimental project of urban planning and entrepreneurialism. 22@: Green areas are the hot spots of Barcelona. 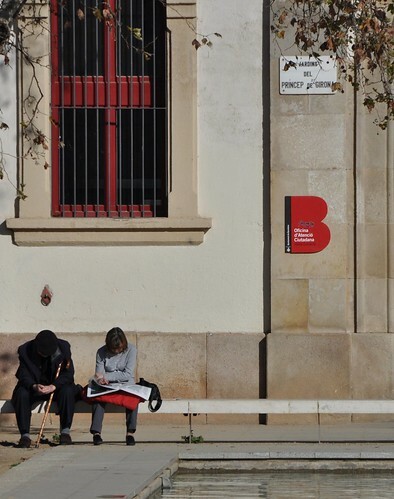 22@ is a regeneration project: the use of refurbished buildings in a neglected part Poblenou, a former industrial hub. Municipal leaders are engaging the private sector — companies, universities, and research communities work in close proximity in clusters in these buildings to accelerate the pace of knowledge sharing and quicken innovation. They’re also creating subsidized housing and green spaces. Green architecture, the Media TIC building in 22@. Interestingly, they’ve created the Barcelona Urban Lab, a public space where companies can pilot test their products that will improve city living, such as the parking and rubbish bin sensors mentioned above. 22@ is proven to be successful because of its sustainability — the five clusters are all united by green infrastructure. Also, from 2000 to 2007, 1,000 new companies and 31,000 new employees were working, an impressive amount of growth in a short period of time. Now, other international cities like Rio de Janeiro, Cape Town, and Boston have followed Barcelona’s lead. Barcelona’s not a perfect city. But with Spain’s overall aging population and an economic recession, local government has found ways to create jobs and improve the quality of daily life for its residents and visitors. Barcelona, now let’s find ways to get rid of dog poop and minor theft. Who’s with me? Mr. Bloomberg eneterted public service with 8 billion dollars and exited after 12 years (as Mayor of NYC) with a personal fortune of 31 billion dollars, like Berlusconi, I charge him as a charletan and a moral criminal that has not respected Unions, workers, fair play and wages and waltzes away smug after arresting folks like a Fascist at antiwar rallys and the Republican Convention his legacy will be soon forgotton versus fondly remembered because he could have set up eco friendly energy plants and done marvelous things outstripping Barcelona but chooses to honor polluting fossil fuels that kill our planet and leave us all in debt and makes MTA (Mass Transit) a ludicrous $2,50 per ride versus being a .25 cent hop aboard happy ride because we are using free clean perpetual energy from intelligent discoveries made 50 years ago by Buckminster Fuller, made 100 years ago by NilokaI Tesla, no warfare gas oil fracking and nuclear continue to destroy and threaten our childrens lives because of a greedy shoprtsighted reptillian monster…. a pervasive sickness that pals around with Larry Silverstien and other 911 murderers, that cater to terrorism and drone warfare. The truth will prevail and the lies will fail, visca la llibertat de energie eco amistos per tot hom. 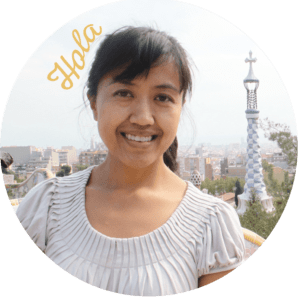 Hi Justine, I’ve just read about the new mobile digital ID system, idBCN. Don’t think I’ll be signing up though just yet. You can read about it here – http://www.mobileid.cat/en. We could add that the open-source software platform behind is Sentilo.io by opentrends, managing sensors and actuators spread all throught the city.